Most of our events start in Schuylerville, NY, Saratoga Springs, NY or Wilmington, NY. We also have a checkpoint for the Adirondack 540 in Ticonderoga, NY. Click on a link to get specific directions to each city. And, if you have any questions, feel free to contact us. 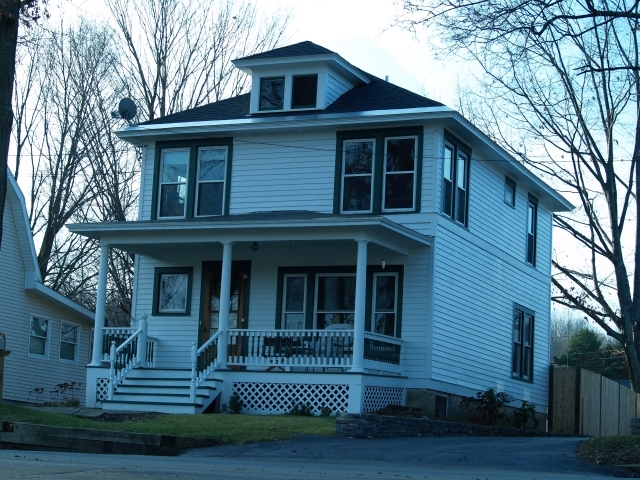 Most of our Schuylerville rides start from the event director's home at 7 Pearl Street. This is a residential neighborhood, so please be courteous when arriving and departing, especially if it is late at night or early in the morning. And, make sure you do not block or impede anyone's driveway, or the street itself, otherwise your vehicle may be towed. Schuylerville is located on the Hudson River about 200 miles north of New York City, 200 miles south of Montreal and 200 miles west of Boston. Schuylerville is centrally located on the Hudson River about 200 miles from New York City, montreal and Boston, and is an area rich in colonial history. The village was first settled in 1691 by the Dutch and called Fort Saratoga, with the surrounding area simply known as Saratoga. The area came to prominence in the fall of 1777, by playing host to to the American's first major victory over the British during the Revolutionary War. This victory resulted in the loss or capture of over 9,000 of their men, and was credited with being a turning point in the revolution. The battle also featured the cunning strategies of Major General Benedict Arnold, without whom the Americans surely would have lost. The village was later incorporated as Schuylerville, to honor the American force's first area commander: General Philip Schuyler. Also, many area roads were named for prominent battle participants, both American and British. And, a 155' stone tall tower was erected in 1855 to commemorate the battle. Take the NYS Thruway (I-87) north to exit 24 in Albany. Take the Adirondack Northway (Interstate 87) to exit 14. Bear right onto Union Avenue/NY 9P. Make a right at the first light onto Henning Road. At the next light, make a right onto Lake Avenue/NY 29. Stay on NY 29 east for about 12 miles to Schuylerville. Make a right turn onto Pearl Street (half way down the hill, by the school and Chinese restaurant), just before the first traffic light in town. Go about 3/10 mile, crossing Burgoyne Street to # 7, on the west side of the street. Take the Adirondack Northway (Interstate 87) south to exit 14. Bear right onto Union Avenue/NY 9P. Make a right at the first light onto Henning Road. At the next light, make a right onto Lake Avenue/NY 29. Stay on NY 29 east for about 12 miles to Schuylerville. Make a right turn onto Pearl Street (half way down the hill, by the school and Chinese restaurant), just before the first traffic light in town. Go about 3/10 mile, crossing Burgoyne Street to # 7, on the west side of the street. Take the NYS Thruway (Interstate 90) to exit 24. Take the Adirondack Northway (Interstate 87) north to exit 14. Bear right onto Union Avenue/NY 9P. Make a right at the first light onto Henning Road. At the next light, make a right onto Lake Avenue/NY 29. Stay on NY 29 east for about 12 miles to Schuylerville. Make a right turn onto Pearl Street (half way down the hill, by the school and Chinese restaurant), just before the first traffic light in town. Go about 3/10 mile, crossing Burgoyne Street to # 7, on the west side of the street. Take the Massachusetts Turnpike (I-90) to Albany. Take I-787 north to Cohoes. Take NY 7 west to the Adirondack Northway (I-87). Continue north on the Adirondack Northway (I-87) to exit 14. Bear right onto Union Avenue/NY 9P. Make a right at the first light onto Henning Road. At the next light, make a right onto Lake Avenue/NY 29. Stay on NY 29 east for about 12 miles to Schuylerville. Make a right turn onto Pearl Street (half way down the hill, by the school and Chinese restaurant), just before the first traffic light in town. Go about 3/10 mile, crossing Burgoyne Street to # 7, on the west side of the street. 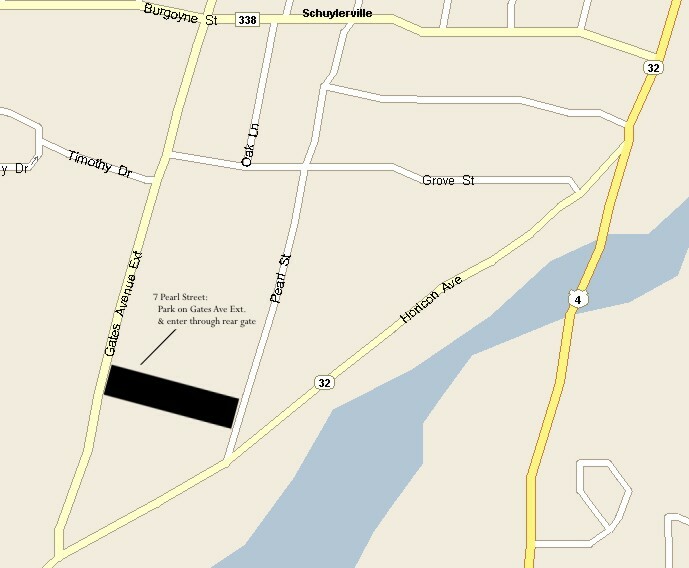 Follow US 4 all the way into Schuylerville. Make a right on Burgoyne Street (one block past the second traffic light in town). Make the first left onto Pearl Street to # 7, on the west side of the street. Take VT 9 west to the NYS border. Continue west on NY 7 to the Adirondack Northway (I-87). Take the Adirondack Northway (I-87) north to exit 14. Bear right onto Union Avenue/NY 9P. Make a right at the first light onto Henning Road. At the next light, make a right onto Lake Avenue/NY 29. Stay on NY 29 east for about 12 miles to Schuylerville. Make a right turn onto Pearl Street (half way down the hill, by the school and Chinese restaurant), just before the first traffic light in town. Go about 3/10 mile, crossing Burgoyne Street to # 7, on the west side of the street. The closest major airport to Schuylerville is in Albany, NY, 36 miles away. Other options include: Burlington, VT (110 miles), Montreal (200 miles), New York City/Newark (200 miles) and Boston (200 miles). All are serviced by major airline carriers and have car rentals available. Regional airports include: Saratoga County Airport (17 miles), Floyd Bennett Memorial Airport in Queensbury (20 miles) and Schenectady County Airport (30 miles). Amtrak has local stops in Fort Edward (12 miles) and Saratoga Springs (13 miles). Other regional stops include Albany/Rensselaer (40 miles) and Shcenectady (33 miles). Please note that Amtrak may be limited in their ability to carry bicycles on this line. For more information call: 800.888.8478 or visit their website: www.amtrak.com. There is plenty of parking on the street. Use Pearl Street in the front, or Gates Avenue Extension in the back. Please make sure you do not block or impede anyone's driveway, or the street itself, otherwise your vehicle may be towed. Registration will usually be in the house, but may also be in the backyard. If it's in the house, just enter through he front door. If it's in the backyard, enter through the second gate off the driveway. The Adirondack 540 and all of its associated races will start from the Alpine Country Inn & Suites, which is located just south of the stop sign at the junction of NY 86 Whiteface Memorial Highway. Wilmington is located about 290 miles north of NYC and 15 miles north of Lake Placid. If you need overnight accommodations, the Alpine Country Inn & Suites has generously offered us a discounted rate. Just ask for Bill or Judy and mention that you are staying for one of our events. Take the NYS Thruway (I-87) north to exit 24 in Albany. Continue north on the Adirondack Northway (I-87) to exit 30. Take NY 9/73 north (left) about 2 miles. Stay straight on NY 73 through Keene Valley to Keene. In Keene, bear right at the second junction of NY 9N, and take it north through Upper Jay to Jay. In Jay, turn left onto NY 86. Take NY 86 about 5 miles to Wilmington. At the stop sign, turn left to stay on NY 86 and the Alpine Country Inn & Suites will be on the right about 1/10 of a mile. Take the Adirondack Northway (I-87) south to exit 34. Take 9N south to Jay. In Jay, turn right onto NY 86. Take NY 86 about 5 miles to Wilmington. At the stop sign, turn left to stay on NY 86 and the Alpine Country Inn & Suites will be on the right about 1/10 of a mile. Take I-90 (NY State Thruway) east to exit 24 in Albany. Continue north on the Adirondack Northway (I-87) to exit 30. Take NY 9/73 north (left) about 2 miles. Stay straight on NY 73 through Keene Valley to Keene. In Keene, bear right at the second junction of NY 9N, and take it north through Upper Jay to Jay. In Jay, turn left onto NY 86. Take NY 86 about 5 miles to Wilmington. At the stop sign, turn left to stay on NY 86 and the Alpine Country Inn & Suites will be on the right about 1/10 of a mile. Take Massachusetts Turnpike (I-90) to Albany. Take I-787 north to Cohoes. Connect with NY 7 west to I-87 north. Continue north on the Adirondack Northway (I-87) to exit 30. Take NY 9/73 north (left) about 2 miles. Stay straight on NY 73 through Keene Valley to Keene. 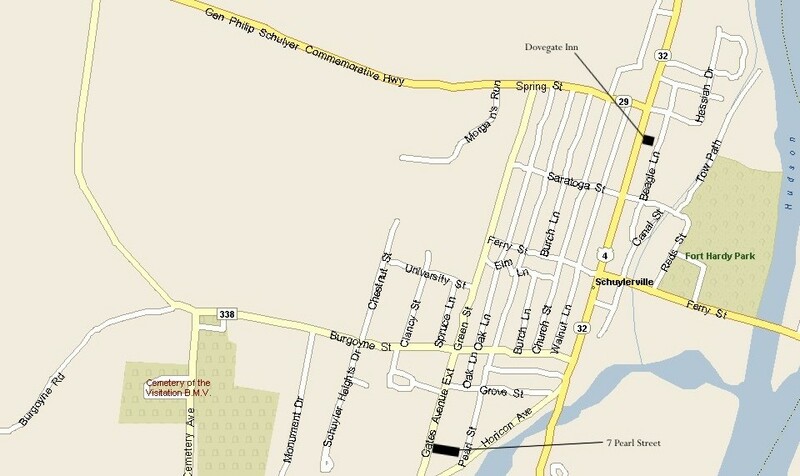 In Keene, bear right at the second junction of NY 9N, and take it north through Upper Jay to Jay. In Jay, turn left onto NY 86. Take NY 86 about 5 miles to Wilmington. At the stop sign, turn left to stay on NY 86 and the Alpine Country Inn & Suites will be on the right about 1/10 of a mile. The closest major airport is the Adirondack Regional Airport in Saranac Lake, about 30 miles away. Other options include: Albany, NY (190 miles), Montreal (100 miles), New York City/Newark (300 miles) and Boston (300 miles). All are serviced by major airline carriers and have car rentals available. Regional airports include: Lake Placid Airport (15 miles), Schroon Lake Airport (45 miles), Floyd Bennett Memorial Airport in Queensbury (90 miles) and Saratoga County Airport (110 miles). Amtrak operates train service between New York City and Montreal with the closest stop to Wilmington in Westport, about 35 miles away. Our Ticonderoga events start from the Super 8 Motel at the junction of NY 74 and NY 22/NY 9N. The Super 8 Motel is located in the Wal-Mart plaza at the southeast corner of the intersection. To enter the plaza, turn south at the light and then make a left just past the Mc Donald’s. Ticonderoga is located about 260 miles north of NYC, between the northern end of Lake George and the southern end of Lake Champlain. The name "Ticonderoga" is one of the most significant and familiar in early American History. The Iroquois word, meaning "the land between the waters," describes the historic portage between Lake Champlain and Lake George used by Native Americans for more then 10,000 years. Its location proved to be strategic to European settlers as well, as it was the site of many battles, including ones fought during the French and Indian War, and the American Revolution. The Ticonderoga area also played a major role in James Fenimore Cooper's novel: Last of the Mohicans. Over fifty plaques throughout the Town of Ticonderoga mark historic sites and remember legendary heroes, including St. Issac Joques, British Lord Howe, Robert Rogers and his Rangers, French General Montcalm, American General Henry Knox and Ethan Allen and the Green Mountain Boys of Vermont. Take the NYS Thruway (I-87) north to exit 24 in Albany. Continue north on the Adirondack Northway (I-87) to exit 28. Take NY 74 east about 15 miles east to Ticonderoga. At the trafiic light at the junction of NY 22/NY 9N, make a right, then a left into the Wal-Mart plaza just past the Mc Donald’s. The Super 8 Motel is located on the left, behind the Mc Donald's. Take the Adirondack Northway (I-87) south to exit 28. Take NY 74 east about 15 miles east to Ticonderoga. At the trafiic light at the junction of NY 22/NY 9N, make a right, then a left into the Wal-Mart plaza just past the Mc Donald’s. The Super 8 Motel is located on the left, behind the Mc Donald's. Take I-90 (NY State Thruway) east to exit 24 in Albany. Continue north on the Adirondack Northway (I-87) to exit 28. Take NY 74 east about 15 miles east to Ticonderoga. At the trafiic light at the junction of NY 22/NY 9N, make a right, then a left into the Wal-Mart plaza just past the Mc Donald’s. The Super 8 Motel is located on the left, behind the Mc Donald's. Take Massachusetts Turnpike (I-90) to Albany. Take I-787 north to Cohoes. Connect with NY 7 west to I-87 north. Continue north on the Adirondack Northway (I-87) to exit 28. Take NY 74 east about 15 miles east to Ticonderoga. At the trafiic light at the junction of NY 22/NY 9N, make a right, then a left into the Wal-Mart plaza just past the Mc Donald’s. The Super 8 Motel is located on the left, behind the Mc Donald's. The Champlain Bridge is out. In light of that, the best way to get to Ticonderoaga from Nothern Vermont is to go around the southern tip of Lake Champlain. Make your way south to Route 4 and take that east to Whitehall. In Whitehall, make a left onto NY 22 and take that north for 25 miles to Ticonderoga. At the intersection of NY 22/74, continue straight to the traffic light. At the light, make a left, then make another left into the Wal-Mart plaza just past the Mc Donald’s. The Super 8 Motel is located on the left, behind the Mc Donald's. Make your way to Vermont Route 9, and follow it west to the NYS border. Continue west on NY Route 7 to the Adirondack Northway (I-87). Take the Adirondack Northway (I-87) north to to exit 28. Take NY 74 east about 15 miles east to Ticonderoga. At the trafiic light at the junction of NY 22/NY 9N, make a right, then a left into the Wal-Mart plaza just past the Mc Donald’s. The Super 8 Motel is located on the left, behind the Mc Donald's. The closest major airport is in Burlington, VT, 54 miles away. Other options include: Adirondack Regional Airport in Saranac Lake, (80 miles), Albany, NY (90 miles), Montreal (130 miles), New York City/Newark (260 miles) and Boston (320 miles). All are serviced by major airline carriers and have car rentals available. Regional airports include: Saratoga County Airport (70 miles), Floyd Bennett Memorial Airport in Queensbury (45 miles) and Schenectady County Airport (85 miles). Amtrak operates train service between New York City and Montreal, with a stop in Ticonderoga.